Boarding Terms and Contract under the "more" drop down button. Print and fill yours out ahead of time and bring with you for a quicker drop off. The form must be complete. Your cats will enjoy there secluded luxury condo. Each having its own peaking window that overlooks the large reception area for their viewing pleasure. There are resting shelves to lounge on and a glass and panel door for ventilation. The cat condo area is on a seperate air conditioning system and has operable opening sky lights for plenty of fresh air. We offer Science Diet sensitive stomach or Taste of the Wild to all boarding cats. We will gladly feed what you provide if you choose to feed something different. We also take animals that require medications and certain medical treatments with written instructions and a current prescription from the prescribing veterinarian. Cats that are using the feline kitty corral for exercise can be seen from the front reception area for clients viewing pleasure. The contract may be viewed at the right. You can pick up the contract form ahead of time for your convenience and date/return it at time of drop off. Housed seperately or with one other feline family member if you choose. Kitty corral time is available for an additional fee for you cat(s) in our feline exercise room. With a climbing pole, toys and viewing windows into the reception area your cat is sure to keep themselves amused. 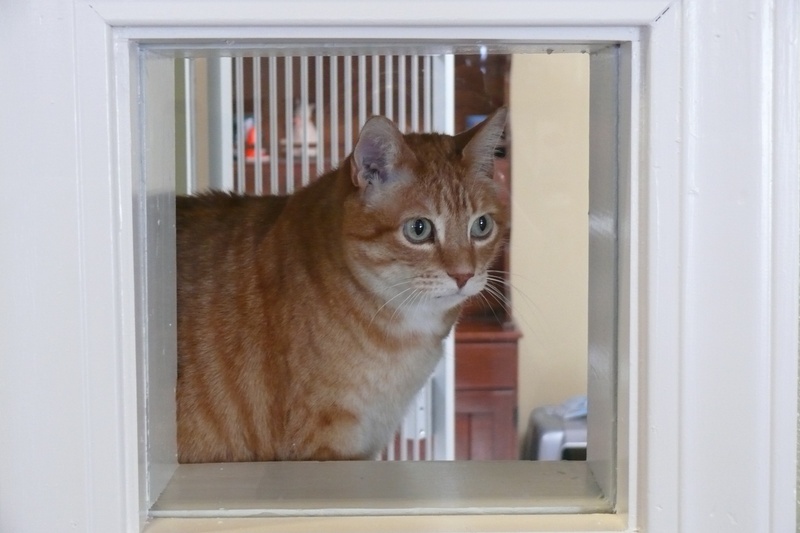 Your feline companion will lounge in one of our private cat condo's that overlook the front entrance reception area. There are resting shelves for them to climb onto as well as the a half glass door to view into the cattery main room. With sky lights and a separate system air conditioning your cat is sure to feel right at home. In addition we have a separate play and exercise room for cats that want to romp and play. If your cat or cats are here for an extended stay and are from the same home, you can opt to board them in this room for an additional $10/day charge. We provide Science Diet Sensitive Stomach dry food, we gladly will feed what you provide if you choose to feed something different. We also take animals requiring medications or certain medical treatments with written instructions and a current prescription from the prescribing veterinarian. The contract may be viewed and printed to fill out ahead of time or you can also pick up the contract form ahead of time for your convenience and date/return it at time of drop off. Any forms filled out and returned must be complete and signed. By signing these forms you agree to the terms and conditions in full. After hours pick up and drop off is available Wednesday, Saturday and Sunday evenings @ 6pm or Sunday morning @ 9am. All pets being pick up must be prepaid and prearranged. Drop off and Pick up are not available on 4th of July morning, Thanksgiving day, New Years day, Christmas Eve evening and Christmas day.